Now that the first week of classes has started, and you’ve gotten off to a fast start by gathering your course syllabi, placing critical dates in your calendar, and identifying your crunch weeks, it’s important to make critical academic and social connections on campus to be successful. Follow these steps to enrich your college learning experience. When I was in college, I wanted to know the big picture before I got into the minutia of any new course. If I didn’t understand where the course was going, I got lost in the minutia until the midterm or the final when I was forced to synthesize weeks or months of material over just a few precious days. Getting the big picture first helped me understand how concepts or ideas strung together, and anticipate where the professor was going. There’s some brain science behind this phenomenon. If an overview of a course or subject is introduced first, you’re more likely and accurately able to recall the material than if you’re just assaulted with the parts or the details. Our minds better remember or “encode” information when we connect concepts into a global understanding. By seeing the big picture, you prime your brain so that when you see the material again, you’re more likely to experience that “aha moment” when it all comes together. Review the syllabus then take advantage of your professor’s office hours prior to getting your first grade to ask about the course and how to maximize your learning. By meeting with the professor early in the semester as I suggested in a previous post (https://karlwreid.com/2013/04/06/get-to-know-faculty-even-and-especially-if-youre-shy/), you’ll speed up those aha moments and increase your recall. I recommend that you form a study group early in the semester, not when you need it! 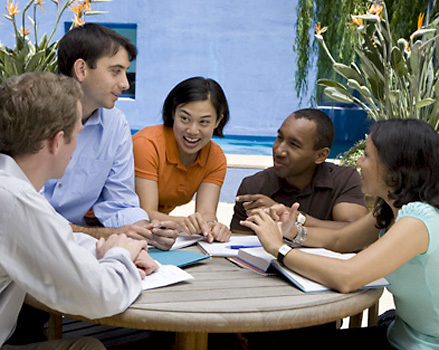 Previously, I wrote about how important study groups are and how to utilize them for maximum impact (https://karlwreid.com/2013/04/14/the-connection-shift-part-ii-how-to-utilize-study-groups/). Here, it is important that you understand that study groups should be formed early in the semester; reach out to classmates within the first two weeks before the first assignments are due. I recommend that you set specific start and end times and a location for your study group, at least two days before assignments are due. Scheduling these meetings ahead of time gives the group members enough time to review and complete their work on their own and see a teaching assistant (TA) if necessary well before the deadline of the assignments. What connections work for you? And for specific tips on how to get to know faculty and utilize study groups, check out the links below. Good luck with Week 2. Jensen, Eric. (2005). Teaching with the Brain in Mind. Association for Supervision and Curriculum Development: Alexandria. VA.